Starting a yoga practice is daunting enough without being befuddled by the yoga lingo coming out of your teacher's mouth. Many teachers use terms derived from the classical language of yoga called Sanskrit; they may or may not follow these with the English translation, so it's helpful to learn the most common yoga words you're likely to hear. Once you've got the basics down, you won't feel so lost during your next practice. In yoga, the breath, or "prana," is thought to be a person's life force. "Ayama" means to extend or draw out; together the two words mean breath control. Pranayama can be used to build heat, or energy, in the body, and it can be used to cleanse and calm the body and nervous system. The most common type of pranayama used in classes today is "Ujjayi" pranayama, also variously referred to as Victorious, Ocean and Conqueror Breath. Ujjayi is a strong breathing technique in which you constrict the back of your throat and exhale as if you're trying to fog up a mirror with your mouth closed. Inhales are slow and slightly audible. 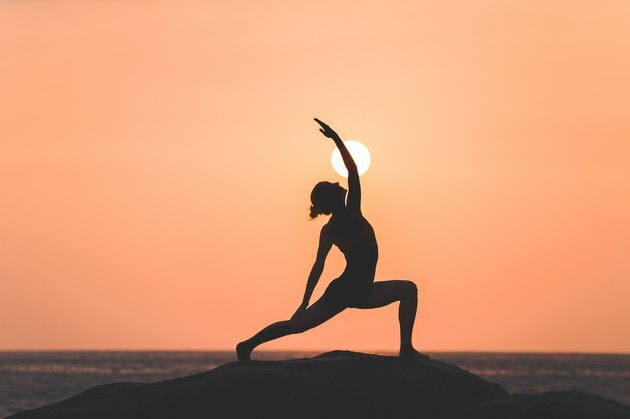 The yoga term "vinyasa" has a few different meanings, but they all relate to the connection of movement and breath. In the vinyasa style of yoga, you flow from pose to pose through a sequence, the pacing of which relies heavily on pacing the breath. You inhale with certain poses and exhale with certain poses. Most teachers provide verbal cues for linking breath and movement. You may also hear your teacher say, "Take a vinyasa." This is the sequence of postures repeated frequently in vinyasa flow classes that involves a combination of Uttanasana (Standing Forward Fold), followed by Chaturanga (Four-Limbed Staff Pose), Urdhva Mukha Svanasana (Upward-Facing Dog) and Adho Mukha Svanasana (Downward-Facing Dog). Drishti is yet another way of focusing the mind during a yoga practice. You might hear your teacher say, "Find your Drishti"; this means find a spot and focus your gaze there so your eyes aren't wandering around the room. Not only does this keep you focused on your own practice instead of checking out your neighbor's yoga pants, but it can also help your balance. Drishti is a soft gaze. If you choose an image on the wall, for example, you shouldn't look at it so directly that you can see exactly what is in the picture. On the contrary, the gaze should be slightly fuzzy. Some poses, especially in practices such as Ashtanga, have their own Drishti points. For example, in an Ashtanga practice when performing Seated Forward Fold, the Drishti point is the toes. Bandhas are internal yoga locks meant to supercharge your practice. With a bandha, you close off, lift up or draw in at particular points on the body to direct energy in the body. In addition to stimulating energy, performing bandhas during practice is believed to cleanse energy channels, tone the organs, improve digestion and concentration, relieve depression and prepare the mind for meditation. Uddiyana Bandha: In this stomach lock, the breath is expelled as the abdominal wall is drawn in and up to produce a hollowing beneath the rib cage. The breath is held until the lock is released. The Sanskrit term Chakra means "wheel" or "disk." As such, chakras are visualized as spinning wheels of energy and light. There are seven chakras, or energy centers, throughout the body: at the heart, throat, crown, forehead, base of the spine, lower abdomen and solar plexus. Each chakra controls different aspects of energy in your body. For example, the third chakra is the source of personal power and the sixth chakra is the center of intuition. It is said that if a chakra becomes blocked, energy surrounding the particular chakra stagnates, disrupting physical, emotional, psychological and spiritual states of being. Yoga is one way to keep energy flowing through the chakras, and some teachers may refer to specific chakras during class. Usually said at the end of class, Namaste is an expression of respect in Sanskrit. It's usually uttered with the hands pressed together in prayer and with a slight bow of the head and upper body. At the end of a yoga class, students and teachers often use this word to thank each other for the time spent together, for showing up and for adding positive energy to the class. The teacher might repeat the most common translation, which is, "The divine light in me bows to the divine light within you." Like many Sanskrit words, namaste has multiple translations, but all of them amount to the same basic idea: We are one. Also called "Corpse Pose," Savasana is the final resting posture. This is a place of complete relaxation, during which your body processes the work that you have just done during the active portion of class. It might surprise you to find out that this is considered a posture just like any other, and there is a correct way of doing it. Although may students look forward to this pose, other students may find it difficult because it requires complete stillness, physically and mentally. Part of the practice is to quiet your mind of thoughts of the past and future. Although it's tempting to think about what you're going to eat for dinner, try to remain present and allow thoughts to simply float by without focusing on anything in particular. Some classes include chanting of a mantra, a sound meant to concentrate energy and focus. One simple Sanskrit syllable, Om, is one of those mantras. When you chant Om, or Aum, as it is also spelled, you are actually making three different sounds, "awe," "oo" and "mmm." The different sounds reflect the creation of the universe, the energy of the universe and the connectedness of the universe. Yoga Journal: What Is Ujjayi? The Chopra Center: What Is a Chakra? Yogi Times: What Is the Meaning of Om?